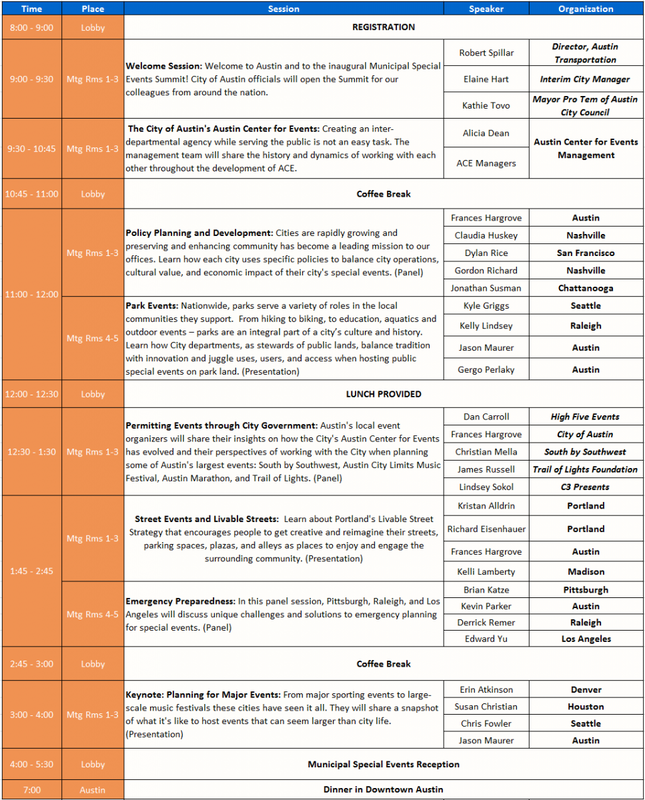 The Austin Center for Events hosted the inaugural Municipal Special Event Summit in Austin, Texas on January 25-26, 2018. The Summit brought together city officials to share policies and practices on municipal special event topics such as: policy development, event management, public safety, budgeting and fees, outreach and engagement, and interdepartmental planning. Thank you for the memories! We hope to see you in Raleigh, NC on January 30 - February 1, 2019. 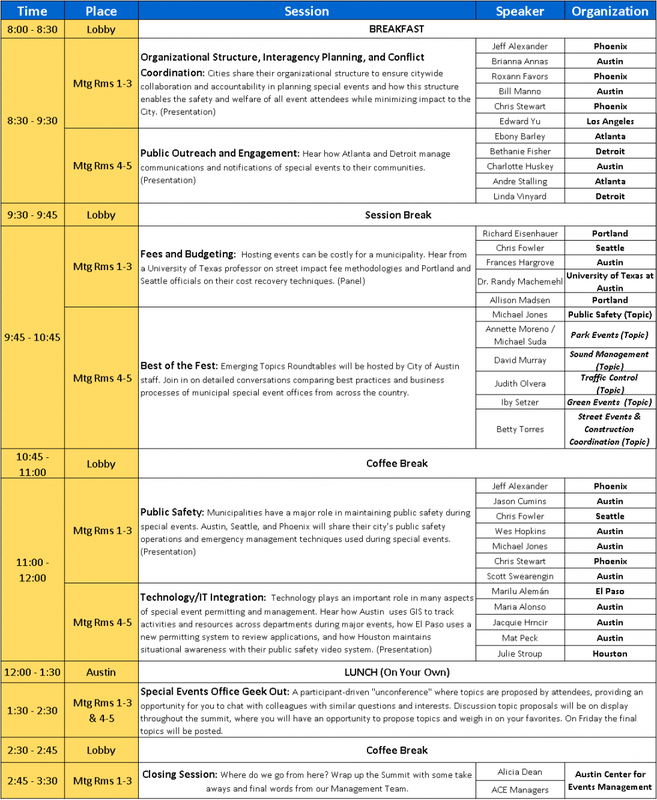 A full program schedule, including speaker information and session descriptions, will be published within the coming weeks. In January we sent out a survey asking colleagues what type of information they would like to discuss. Below are the top hits we received. There is still time to fine tune the programming. Final survey results are linked here. General Assembly - Everyone together to learn about an overarching Special Events topic. Panel - Presentations, with up to four speakers, that relate to the themes of the event. Roundtable - Discussions into a specific topic affecting the themes. The City of Austin will be hosting this inaugural event at the Palmer Events Center, one of our state-of-the-art spaces in the heart of the city. 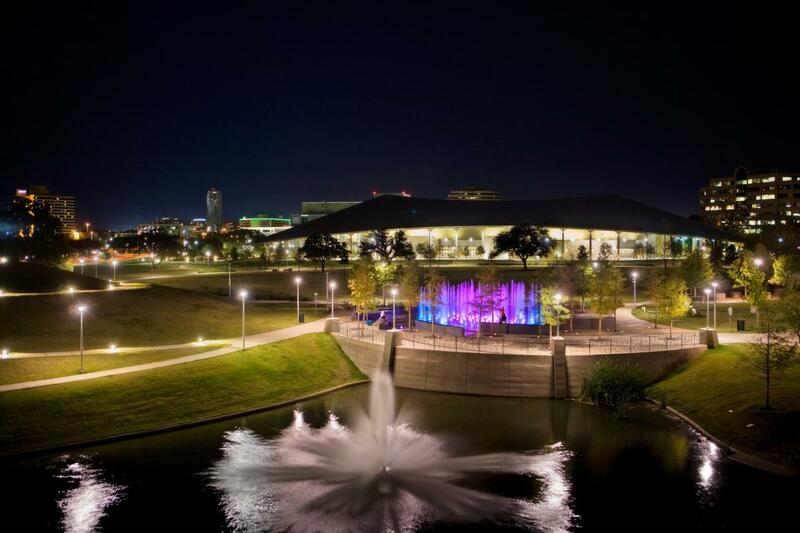 Within a few walkable blocks you'll also find the famous Lady Bird Lake hike and bike trail, legendary live music venues and some of the best margaritas in the country. Can't make it? Join our Municipal Special Events Network listserve to get updates on conversations and hot topics. Email us at TransportationSpecialEvents@austintexas.gov or give us a call at 512-974-6501 with questions or for more information.